Lately, more and more of our Brides have literally been cutting the cake…as in, cutting it out of the wedding altogether! Try a series of cakes in different heights, sizes and colors. 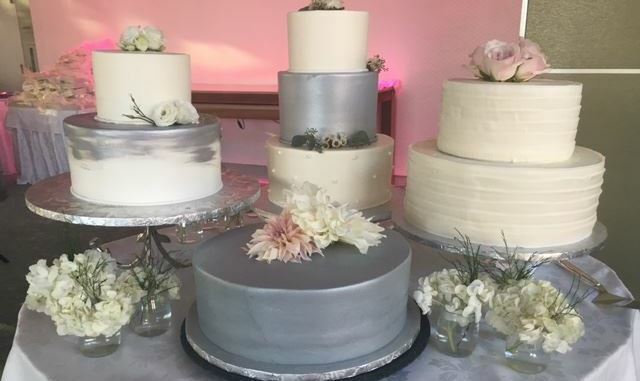 One of my recent couples did a gorgeous series of cakes in their wedding colors. This was a great way to differentiate the cake table, made for beautiful photos, and was easy for our talented culinary team to plate; garnish, to put on a station later in the evening so guests could select a slice from their favorite flavor. If you don’t love the looked of slice cake…. Try cupcakes. They are still in style, and with so many great bakeries in town that have gorgeous cupcakes in a variety of flavors. We are thrilled to partner with Georgetown Cupcakes as part of our package, and they continue to be a favorite of many of our chic couples. Scale down! Do a small, ornate cake just for photo ops, and bring in a “kitchen cake”, which is basically a large sheet cake that has fewer bells and whistles but is also far less expensive. Don’t worry about your guests questioning how that small cake ended up feeding the whole group, I guarantee they will be so busy feasting on frosting and getting to the dance floor to burn the calories they will never even notice! That is perfectly fine, too. One of my most stylish brides in October doesn’t like cake. Enough said, we are modifying the day without it and I guarantee nobody will even miss it, as she is replacing it with gorgeous fall dessert stations and passed minis. Every couple should have their day, their way, with or without the cake!